We come to the end of our first phablet shootout. It was only logical that the market segment that experienced staggering growth over the past year and a half will start producing fierce clashes of its own. Samsung has certainly enjoyed the time when it was alone at the top and took full advantage of it, but the competition has finally caught up and is ready to trade blows with the Note lineup. LG was the first to try and offer an alternative after the Note went mainstream, but its first attempt failed miserably. The Optimus Vu just tried too hard to set itself apart from the Galaxy Note with its 4:3 screen and became unwieldy in the process. Truth be told, LG wasn't ready to offer a proper alternative back then, so that gamble might have been its only choice. Things are way different now. The LG Optimus G Pro was specifically designed to be the Galaxy Note killer and it doesn't fear facing the Samsung phablet on its own turf. It may be coming late to the market, but it has certainly made the time count and has equipped itself with a nice new chipset, a 1080p screen and a high-res 13MP camera. Barring any major surprises in the near future, these welcome upgrades over the Note II, should be enough to turn the LG Optimus G Pro into the phablet to have come its market release in the next quarter. It simply won more of the rounds that count and unless LG makes another mess of its software update schedule might be one of the most successful devices by the company in recent times. Giving up the crown to a device that comes to the market some good eight or nine months later probably won't hurt the Galaxy Note II ego too badly. In fact, the Samsung flagship's morale will probably be boosted by the fact that there are still reasons (few as they might be) why people might choose it over a far newer device. The first of these reasons is the still unique S Pen pressure-sensitive operation, which adds a whole new dimension to the smartphone experience for the creative types and those who like to take lots of notes. 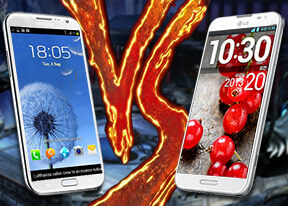 There's also the better battery life, which is crucial to many power users and the better video recording quality. Finally, but certainly not least importantly, the Galaxy Note II has undergone several price cuts and will likely cost about €150 less than the LG Optimus G Pro. While those who want the latest and greatest technology will certainly find the premium price of the LG flagship easy to justify, the fact remains that the Galaxy Note II is still a stellar device that will serve its purpose well, while saving you a quite a few bucks. So as the two contenders part ways, each will have its own reason to celebrate. LG Optimus G Pro walks off with a promise to be the new king of the phablet realm, once it comes to the market (by May-June 2013). 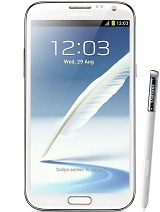 The Samsung Galaxy Note II, on the other hand, can rest assured that come the summer, it will still be a purchase no one is likely to regret, even eight or nine months into its product life.